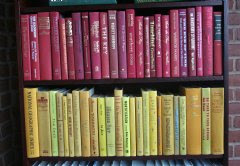 I am currently in the process of arranging my books by color. Not only do I think it has design appeal, but it actually helps me find things. I have never been a person to whom the name of a book or its author comes easily. My close friends will know that I also never know the name of an actor or movie off of the top of my head - something that is incredibly frustrating for me, given that no one else around me seems to have this problem. I do, however, recognize books and people when I see them - hence the color rearrangement. This seems to be an aesthetic obsession with a lot of people lately and I have been seeing this site around on the blogs but I'm not sure how I feel about buying books "by the foot" in accordance with a specific genre or, more commonly, a specific color or look. I am a big believer in the patrolling of bookstores and picking things up based on recommendations from friends, NPR, or, less often, based solely on the cover or jacket. 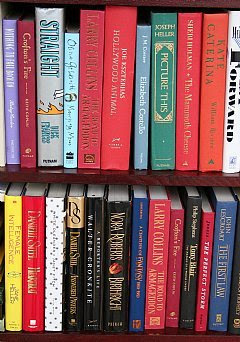 The most bulk buying I have ever done is to pick up a paperback lot of a favorite author on eBay, a fantastic bargain if you like to read prolific writers and have no desire for a perfect-looking bookshelf. But now, buying books based solely on looks or a grab-bag from one genre - I cannot decide if this is good or bad. Would most people be purchasing these just for the look? You can even buy books that make your library look more scholarly or technical. Wouldn't you want to hand-select technical manuals that actually apply to your profession? Are these libraries just set-dressing for the immaculately designed home or are these covers actually being cracked? I hadn't heard of that site, but I totally arranged our big bookshelf by color and get so much crap for it! I'm glad to hear I'm not alone!! I arranged my books by color too, and hubby hates it - he can't find anything! I'm not sure about choosing books based on looks or genre...I like a good read and I'm a firm believer in being able to tell a lot about a person by what he/she has on their bookshelf. That being said, I do love the look and feel of old hardcovers. Maybe I'll check this out! 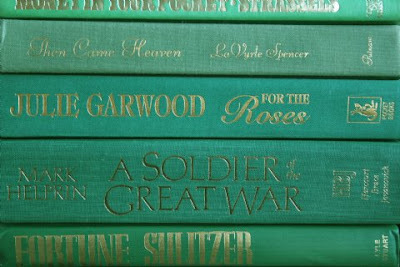 I like the idea of arranging your books by color, they'd look really stylish! I have to agree with Geek in Heels, I'm not entirely sold on buying in bulk based solely on aesthetics. Personally, I probably wouldn't be able to justify the expense for books I had little intention of reading. I'd be willing to try bulk genre buying as an interesting way to stumble upon something I might like though. This is probably making too much of a fun project, but if you have some old, worn-out favorites, maybe you could look for new copies based on color? Buying any book is fun though! It'd be exciting to see what you get with a book by the foot, grab-bag type of deal.